This is an exceptional collection of critical essays, bringing together specimens of what we might call scholarly ekphrasis: the authors read Shakespeare through the European modernists, while also reading Anglo and continental modernisms through their respective (and many) Shakespeare’s. Exploring a long-neglected area of reception and influence, the editors assembled studies on Shakespeare and modernism, including the continental modernisms—a connection which has not figured prominently on the radar screen of dominant Anglo-centered approaches. This ekphrastic perspective informs Giovanni Cianci and Caroline Patey’s collection of essays, given originally as conference talks at the Università degli Studi, Milan, by European scholars (or European by birth, as is one scholar, Marjorie Perloff). The European modernists through whom the Bard is being read are grouped in three sections: the High (Anglo-American) Modernists, the European continental moderns, and the Irish modernists. Among the individual authors who constitute the chapters’ successive ekphrastic lenses we have W. B. Yeats, Ezra Pound, T. S. Eliot, Virginia Woolf, Wyndham Lewis, and Wilson Knight; Ludwig Wittgenstein, Luigi Pirandello, Henri Bergson, Jules Laforgue, Tristan Tzara, Bertold Brecht, and Fernando Pessoa; James Joyce and Samuel Beckett—with Friedrich Nietzsche, a powerful catalyst and father of the avant-gardes, providing an undercurrent all through. Shakespeare embodied for the modernists their own fundamental dilemma concerning their relationship to tradition. He was either rejected—overwhelmingly on the continent—because of representing an “excess of history” (Nietzsche) and “the father’s cadaver” (Apollinaire), to be thrown “overboard from the ship of Modernity” (Italian Futurists). Or, understood as the “classic of motion” by the Anglo-American avant-gardes predominantly (Yeats, Pound, Eliot, Woolf, Lewis), he would be embraced, revitalized, and re-appropriated as a liberating classic. Studies surveying forms of the latter, re-appropriation, make up the first large section of the volume. Insisting that Yeats reclaimed Shakespeare for Ireland, Massimo Bacigalupo surveys how the Bard pointed the Irish poet towards tragic irony and a pre-modernist vision of human affairs. Shakespeare’s influence also shows, Bacigalupo points out, in Yeats’s richness of style, his “willingness to take risks by jumping from the personal to the public,” as well as in providing a model for his “modernist phantom of order” (28). Pound, on the other hand, “remade Shakespeare much in his own image,” identifying him not just as “the world’s greatest dramatist” but as “the great past-master of pastiche,” who served both as the model for both his own epic project and a predecessor struggling to “resuscitate the dead of poetry” by returning to poetry as song (32-35). Expounding G. K. Hunter’s familiar claims that Eliot, responsible for making Shakespeare the first modern, virtually invented the 20th century Shakespeare, Jason Harding traces three different phases in Eliot’s opinions concerning the Bard: the iconoclastic phase marked by the Hamlet-essay, the phase of accommodation to Christian belief, and the last phase of the effort of the practicing dramatist doing justice to both the musical and the dramatic excellence of the Bard’s works. References to Shakespeare outnumber references to other dramatists, Harding claims, concluding that “Shakespeare is the most persistent presence of all in Eliot’s works” (40). Carlo Pagetti uncovers a rather complex and even controversial relationship to the proteiform character” (59) of Shakespeare in Virginia Woolf’s oeuvre. In earlier writings, “Master William” seems an intentionally marginalized figure in Orlando and a negative example of domineering masculine values in A Room of One’s Own. However, later, she came to conduct an intensive dialogue with Shakespeare, who seemed to possess “the key to the human heart” for Woolf (68). This holds especially for Woolf’s unfinished novel, Between the Acts, which abounds in Shakespeare references and echoes. The essays in the second section deal with the Shakespeare’s of the European continental modernists. Challenging the view expounded by F. R. Leavis, George Steiner as well as Robert Harrison and Stephen Orgel that Wittgenstein was a blind reader of literature, who did not comprehend Shakespeare, Marjorie Perloff describes a more complex and subtle relationship between the philosopher and the Bard. Admitting that Shakespeare “was not a congenial poet for Wittgenstein” (122), Perloff explains his mistrust by his position and state of mind as exile. Born into one of the most cultured and elegant Viennese families, Wittgenstein was deeply rooted in German culture, where the Golden Age was not the Renaissance but the age of Goethe, and “the classics came into being a full two centuries” after Shakespeare (113). So his ambivalence to Shakespeare can also be understood as a “function of his peculiar Germanic modernity” (112). Yet this Germanic modernity (and his familiarity with the work of his Viennese contemporaries) allowed him to uphold, among others, the conceptualist notion that the poetic construct is a matter of perspective or framing, and to apply it to Shakespeare too. Towards the end of his life, Perloff explains, “Wittgenstein came to Shakespeare” (115), considering even to use a quotation from King Lear—“I’ll teach you differences”—as the motto for Philosophical Investigations, where failure in discrimination is a major theme and repetition is understood as a language game. Above all, he called Shakespeare “a creator of language” (119) because in his dramas he invented a language with its own laws, and did this according to the logic of dreamwork, another language game “true according to its own laws” (121). Pirandello’s interest in Shakespeare is the topic of Claudia Corti’s essay, discussing Enrico IV as Hamletian metatheatre. Pirandello’s overwriting embodies both modern humor—“transcendental farce,” or “the tragic overpowered by laughter” (126)—and the reflective posture whereby Shakespeare transformed Orestes into the Hamlet of introspection and creative madness. Investigating Jules Laforgue’s play Hamlet and Tristan Tzara’s collage Mouchoir de nuages as “radical experiment” and a “cunning compound” (Valéry), respectively, Silvia Riva analyzes the ways Laforgue calls literature into play, and Tzara blends texts and techniques while addressing the issue of truth in poetic language. The concept of teatrum mundi provides the prism through which George Oppitz-Trotman explores Bertold Brecht’s relationship to Shakespeare. For Brecht, Shakespeare’s “greatness” lay in the collaborative enterprise of his theatre, where the Bard was less an author than an actor—much like Brecht saw himself in his own theatre. The last essay in this section discusses Portuguese modernist Fernando Pessoa’s assimilation of Shakespeare, both in his critical studies of Shakespeare and his 35 Sonnets, all composed in English. Vincenzo Russo emphasizes the “web of otherness” in the Portuguese contribution to Shakespeare’s re-appropriation by European modernism, showing forth in the sense of contemporariness and amusement of the poet who saw himself as a “pretender” (204). In the third section of the volume two essays deal with Shakespeare’s Irish voice. Laura Pelaschiar reads the ambiguously complex relationship of Joyce to Shakespeare as one of “adversative admiration” (210), a relationship which, over time, grew from critical adversity to intertextual admiration. Pelaschiar discusses the early essays in which Joyce wrote on the dramatic inadequacies of Macbeth and the artistic incompetence rendering both Hamlet and Othello failures, the latter spectacularly falling short in comparison to Ibsen’s When We Dead Awaken. Pelaschiar then goes on to demonstrate how in Joyce’s mature works Shakespeare became an essential part of the creative process, most obviously in the “Shakespeare-soaked epics” of Ulysses and Finnegans Wake. The trajectory of the Beckett/Shakespeare nexus is the topic of the last essay, written by Caroline Patey. Shakespeare is the primary intertext in the works written during Beckett’s English phase, thick with quotations, near-quotations, textual residues, and resonances taken from Hamlet, The Tempest, and King Lear primarily. But, as the author is quick to point out, “resonance and quotation […] do not necessarily imply genealogy and ancestry” (127); for it is English itself that is saturated with the Bard’s sentences. And it was probably in order to get rid of Shakespeare’s “overbearing weight” (232) that Beckett switched to French and thus “silenced the Bard”—only to come under the comparable influence of Racine, Patey argues. Once these ekphrastic readings are performed and applied to all three groups—the High Modernists, the continental modernists, and the Irish modernists—, and the several unexplored modernist reactions to Shakespeare and tradition in general are observed, the field of modernist studies will expand in two directions: trans-nationally and across art forms. Trans-national scholarship will go beyond the confines of an Anglocentric critical perspective to include Continental European scholars. Moreover, trans-national scholarship will allow modernist studies to refocus on the avant-guerre, the period whose importance has been systematically downplayed by Anglocentric criticism but whose enormous output was appreciated by continental scholars. At the same time, scholarship across various art forms will give attention to the radical innovations in fields other than literature, the plastic and visual arts. This double expansion of time frame and art forms holds especially for Giovanni Cianci’s essay on the Shakespeare’s of Wyndham Lewis and G. Wilson Knight. Cianci focuses on Lewis’s watercolors of Timon of Athens, “elegant abstract compositions in a stylistic synthesis of the static Cubism and dynamic Futurism” (79). Born out of a preference to the image over the verbal so characteristic of the avant-guerre modernists, these visual representations embody the Anglo modernists’ understanding of Shakespeare as the classic stimulating radical innovation. Reading drama from the perspective of the modernist theme of simultaneity, or the new vertical dimension of Dionysian spirituality, Knight’s “spatial criticism” as expounded in The Wheel of Fire gave a different kind of stimulus towards the visual, Cianci concludes. 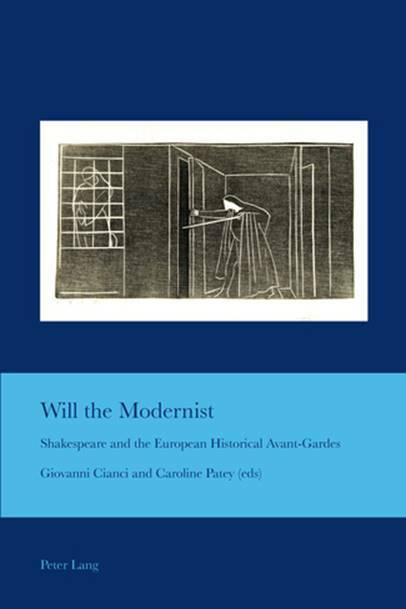 Although Giovanni Cianci and Caroline Patey’s collection of essays tells more about the modernists than Shakespeare, the ekphrastic perspective employed throughout allows for new insights in both directions. For although by understanding how they interpreted the Bard we probably learn more about the modernists than Shakespeare, yet the many-voiced reevaluations presented in the volume produce new knowledge on Shakespeare himself, placing him squarely among the modernists—as one of them indeed, as the title claims.